The basics of using Connect Switch Manager. The Switches page allows you to configure the network switches installed in the site. It gives you a 'live' graphical representation of the switches. Select Switches from the main navigation. Select the required switch from the Please Select a Switch dropdown menu. Once you have selected a role and the client, click Save. You will then see a graphical representation of the selected switch. 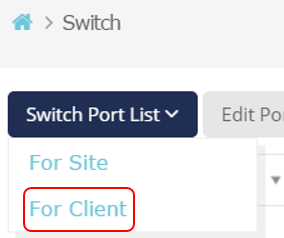 To see all patching information for a single client, choose the client from the dropdown and then For Client from the Switch Port List dropdown. 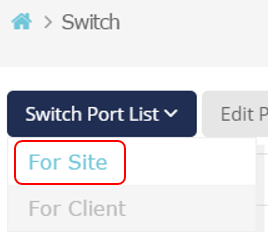 To see all patching information for the site, choose For Site from the Switch Port List dropdown. You can view the list in a table or export it to CSV for auditing by clicking on the Export link. To edit port details, click Edit Port. If one or more of these ports are already configured for another customer, you will get a warning but will be allowed to proceed and reconfigure them.